Sitemap is an XML document which lists out all the URLs of your site in an XML format so that search engines can easily identify and crawl pages on your website. The location of the sitemap is usually specified in the site’s robots.txt file(which will be read by the Search Engine Crawlers). If you look at the robots.txt file of any Blogger Blog, you will find that it specifies a new sitemap URL. If you take a look at this URL, you can see that it lists out the URLs of all posts on BP along with their last modified timestamp. This information will help the crawlers in easily identifying any new entries on your blog. Google can easily find out your sitemap URL by reading your robots.txt file, but in case you want to explicitly specify the Sitemap URL and see the crawl/indexing statistics, you can update the new Sitemap URL in Webmaster tools. To add the new Blogger Sitemap, login at the below URL using your Google account. If your blog was already added to webmaster tools, then it will be listed on Webmaster tools, if not add it using the “ADD A SITE” button. Once your blog is listed on WebMaster tools, click on the site name so that it takes you to the Site Dashboard. Once it’s submitted, you can see the results on the same page. If you had previously added blogger’s RSS/ATOM feed as the sitemap using old methods, you can delete them(or you can keep them, it doesn’t make a difference). Question #1 – Is this feature available for custom domain blogs or blogspot blogs or both? 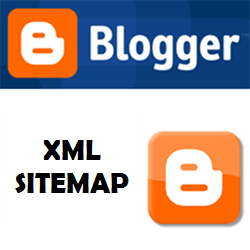 The Blogger XML sitemap is available on all blogger blogs including custom domain blogs or normal blogspot blogs. you just need to append /sitemap.xml to your blog’s home page URL to see the sitemap. Question #2 – Can I add this blogger XML sitemap to Google Webmaster tools? Question #3 – Should I add blogger’s ATOM/RSS feed as blogger sitemap? No you no longer need to do that. Blogger RSS/ATOM feeds will have a maximum of 500 posts. If you use the ATOM/RSS feed method, you will have to add new feeds everytime you make another 500 posts on your blog. Instead you can just add sitemap.xml as the only sitemap for your blog. Blogger will automatically add new posts to this sitemap and convert itself into a sitemap map in case there are more posts. So you can just add sitemap.xml and let Google/Blogger do the rest. Question #4 - Should I then remove the old RSS/ATOM sitemaps from Webmaster tools? Yes you can remove the old feed based sitemaps, but it’s not mandatory. I deleted the old. In with the new. Merci, meilleurs voeux pour 2015! many thanks for you. When this is be approved for blogger? and what about free domains www.example.blogspot.com ? It's already available on all free blogspot domains as well as custom domains. What put the atom xml and xml sitemap simultaneously no effect. ..?